Bernard Guy Georges Cazeneuve is a French politician and lawyer who briefly served as Prime Minister of France from December 2016 to May 2017. Born in Senlis, Cazeneuve rose to prominence with his election in 1997 as a Socialist member of the National Assembly representing the 5th constituency of the Manche department, and as Mayor of Cherbourg-Octeville in 2001. François Gérard Georges Nicolas Hollande is a French politician who served as President of the French Republic and ex officio Co-Prince of Andorra from 2012 to 2017. He was previously the First Secretary of the Socialist Party from 1997 to 2008, Mayor of Tulle from 2001 to 2008, and President of the Corrèze General Council from 2008 to 2012. Hollande also served in the National Assembly of France twice for the department of Corrèze's 1st constituency from 1988 to 1993, and again from 1997 to 2012. Dominique Marie François René Galouzeau de Villepin is a French politician who served as Prime Minister of France from 31 May 2005 to 17 May 2007 under President Jacques Chirac. Édith Cresson is a French politician. She is the only woman to have held the office of Prime Minister of France. Her political career ended in scandal from corruption charges while she was the European Commissioner for Research, Science and Technology. According to article 21 of the Constitution,  the Prime Minister "shall direct the actions of the Government". Additionally, Article 20  stipulates that the Government "shall determine and conduct the policy of the Nation", and it includes domestic issues, while the President concentrates on formulating directions on national defense and foreign policy while arbitrating the efficient service of all governmental authorities in France. Other members of Government are appointed by the President "on the recommendation of the Prime Minister". In practice the Prime Minister acts on the impulse of the President to whom he is a subordinate, except when there is a cohabitation in which case his responsibilities are akin to those of a Prime Minister in a parliamentary system. The Prime Minister can "engage the responsibility" of his or her Government before the National Assembly. This process consists of placing a bill before the Assembly, and either the Assembly overthrows the Government, or the bill is passed automatically (article 49  ). In addition to ensuring that the Government still has support in the House, some bills that might prove too controversial to pass through the normal Assembly rules are able to be passed this way. The Prime Minister may also submit a bill that has not been yet signed into law to the Constitutional Council (article 61  ). Before he is allowed to dissolve the Assembly, the President has to consult the Prime Minister and the presidents of both Houses of Parliament (article 12  ). The French order of precedence is a symbolic hierarchy of officials in the Government of France used to direct protocol. In France, the Gaullist Party is usually used to refer to the largest party professing to be Gaullist. Gaullism claim to transcend the left-right divide but in practice the current Gaullist party is the centre-right Republicans. 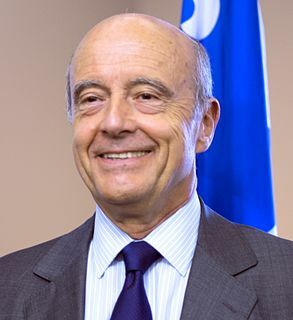 Alain Marie Juppé is a French politician, and a member of The Republicans. He was Prime Minister of France from 1995 to 1997 under President Jacques Chirac, during which period he faced major strikes that paralyzed the country, and became very unpopular. He left office after the victory of the left in the snap 1997 elections. He had previously served as Minister of Foreign Affairs from 1993 to 1995, and as Minister of the Budget and Spokesman for the Government from 1986 to 1988. He was President of the political party Union for a Popular Movement (UMP) from 2002 to 2004 and mayor of Bordeaux from 1995 to 2004. Édouard Balladur is a French politician who served as Prime Minister of France under François Mitterrand from 29 March 1993 to 10 May 1995. He unsuccessfully ran for president in the 1995 French presidential election, coming in third place. At age 89, Balladur is currently the oldest living former French Prime Minister. Presidential elections took place in France on 23 April and 7 May 1995, to elect the fifth president of the Fifth Republic. Cohabitation is a system of divided government that occurs in semi-presidential systems, such as France, when the President is from a different political party than the majority of the members of parliament. It occurs because such a system forces the president to name a premier that will be acceptable to the majority party within parliament. Thus, cohabitation occurs because of the duality of the executive: an independently elected President and a prime minister who must be acceptable both to this president and to the legislature. Charles Pasqua was a French businessman and Gaullist politician. He was Interior Minister from 1986 to 1988, under Jacques Chirac's cohabitation government, and also from 1993 to 1995, under the government of Edouard Balladur. Renaud Donnedieu de Vabres, often known as RDDV, is a French politician, France's Minister of Culture from 2004 to 2007. He is a member of the UMP center-right party, and the grandson of Henri Donnedieu de Vabres. Philippe Séguin was a French political figure who was President of the National Assembly from 1993 to 1997 and President of the Cour des Comptes of France from 2004 to 2010. Presidential elections were held in France on 24 April and 8 May 1988. The Government of the French Republic exercises executive power in France. It is composed of the Prime Minister, who is the head of government, and both junior and senior ministers. Senior ministers are titled as Ministers, whereas junior ministers are titled as Secretaries of State. French legislative elections took place on 21 and 28 March 1993 to elect the tenth National Assembly of the Fifth Republic. The 14th legislature of the French Fifth Republic is the parliament elected in the French legislative election, 2012.